After yesterdays awesome shot I thought it might be difficult to come up with something that is comparable, but I have found this one. And it is fantastic. Check out this well thought out bag. Hi! I’m Alessandro and i am an Italian 24 years old architecture student (still for a few months). 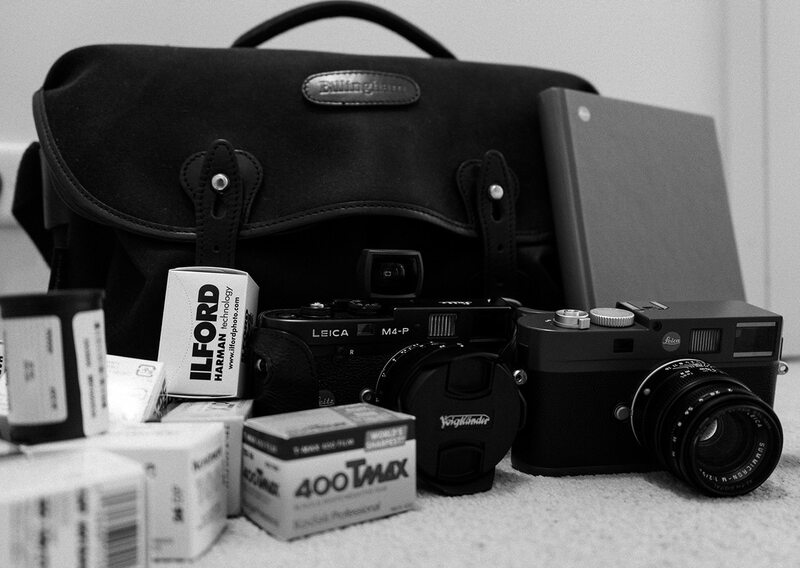 I became interested in photography and cameras after i undusted my father’s Olympus OM1, 2 years ago. After a while i purchased a Canon EOS450D to move my first steps in the digital photography world. Thanks to web research and some yt channels like “The Mijonju Show” I soon realized that there are tons of other formats to shoot with, so i picked up a Holga from HK and started to experiment with some medium format film; it’s amazing the level of detail you can get from a 6×6 negative! In the last years i’ve been affected by a rare form of GAS and bought a lot of cameras i didn’t really need, but i’m slowly recovering..
– Moleskine: always useful, i use for my university sketches and to write things i have to remember. – iPod: can’t live without music on the train to the university in Venice. – iPhone 3GS: old but still going. Favourite app: hipstamatic. 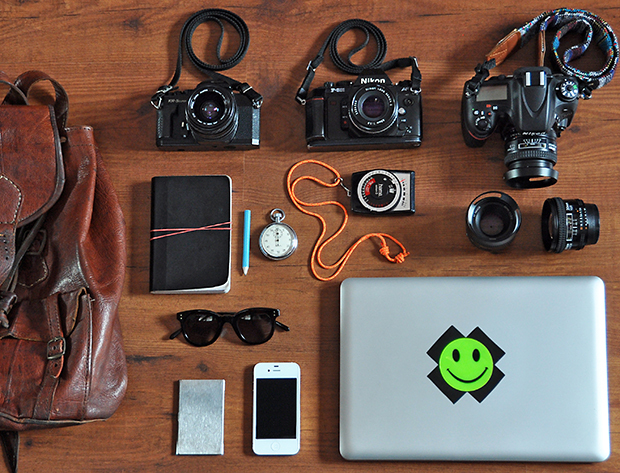 – Holga: for the times i want to shoot MF. I painted it white to customize it, i wasn’t a fan of total black look and lomography charges too much for a color model. – Fujicolor Reala 100 / Agfa APX100: both came with the camera, both expired but i’m storing them in the fridge. – Lomography 400: i got a lot of these for free, and i use them to test cameras or to shoot with a compact Yashica T AF, not in the picture. When i have time to shoot i upload on flickr http://www.flickr.com/photos/regi_a, just the things i think are worth it. Brilliant. 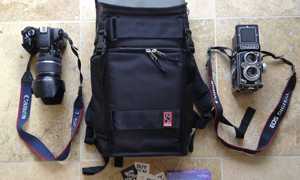 Thanks for sharing this bag with us Alessandro and thanks for sharing your story of your conversion to film. I love the colour in this bag shot. Check out Alessandro’s links and follow him on twitter. Don’t forget to comment for that Camera Karma. Thank you very much for sharing my bag bellamy!! 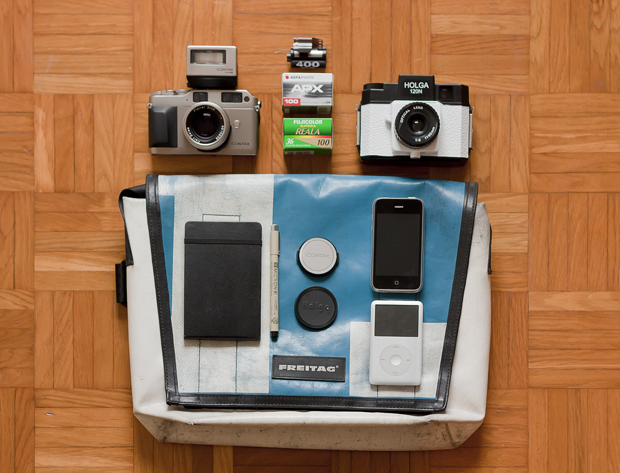 I’ve just bought a Freitag bag and love it! 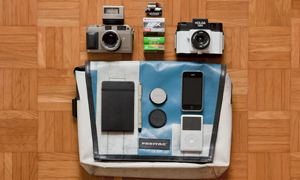 Great bag, love the custom colour Holga. I think I might do something similar.